The full story of Ireland’s economic highs and lows over the past generation will no doubt be examined in many books for years to come. That’s no consolation, however, for people who are voting in a few weeks and who want to know where we are and what we need to do. They want to know which painful hits they should take, and which they shouldn’t. To know what to do next, we need to know how we got here and how bad things are, so this post aims to give a bare-bones outline of how Ireland dug itself into a hole, how deep the hole is and the kind of things we need to do to get back out of the hole. Irish policymakers essentially made five major mistakes over the past fifteen years. The first four can be grouped largely under the heading of: “We just didn’t prepare for life in the eurozone”. While we prepared for entering into the eurozone, we didn’t prepare for when we were actually in the eurozone. Specifically, when you’re in a currency union, you don’t have your two main tools for stabilising the economy – interest rates and exchange rates. You may wonder, then: why on earth would you enter a currency union? Those who took out mortgages in the 1980s can confirm that Ireland was plagued by high and volatile interest rates, something you escape in a large currency union. Secondly, having your own exchange rate means you can be picked on by the markets. So Ireland made a trade: we gave up our two primary tools for stabilising the economy, in return for life in a eurozone of low and stable interest rates and a stable currency. But if you do that, your main tool for smoothing the ups and downs of the economic cycle becomes your fiscal policy – what the Government taxes and spends. You keep some gas in the tank, so to speak, so when a recession hits, you can crank up spending. Unfortunately, as the first two mistakes point out, it seems the Government is only learning that lesson now. Government Spending: Do you run your household finances according to the principle, “When I have money, I spend it – when I don’t, I won’t”? Almost certainly not, I would say. You borrow and save to smooth out your consumption over time. And what holds for a household is true for a country. The government, however adopted a principle of “Spend when we have it” in the late 1990s and total spending increased from €27bn in 1998 – increased spending by an average of 10% a year, until gross spending topped €76bn in 2008. Clearly, if you increase spending at that speed, the focus and quality of your spending is going to suffer. Taxation: At the same time, the way we were all taxed went bananas. A good tax system is one where your marginal rate of tax (i.e. the tax you pay on the next euro you earn) is similar to your average tax rate (what percentage of all your income is paid in tax). Unfortunately, the Irish system is all wrong. Thanks to overly generous tax-free credits, we have not only some of the highest marginal rates in the OECD, we also take very little tax off the majority of workers. For example, the middle earner in 2006 paid about 4% income tax. The OECD calculates an all-in tax on wages each year. In Ireland, it went from 10% to negative between 2001 and 2007. Everywhere else, it stayed about 20%. We all like to think of ourselves as over-taxed. We’re not. Building: I’m an economist – I love markets, I think they’re great ways of allocating resources. However, they’re not perfect. So if you have a really important market, it needs management and supervision. One such market the government failed to supervise was the housing market. For every 100 people living in the country, Ireland built 14 homes between 2000 and 2007, whereas most countries built about 3 in the same period. Government revenues from the property market increased from €3bn to €9bn as the bubble intensified, an important part of the puzzle of rising spending but a screwy tax system. Banking: Bubbles need a source of credit to happen in the first place and this happened by not controlling the single most important sector in the economy – the financial sector. Modern financial systems are based on long-term debts financed by short-term deposits, therefore they are inherently fragile and so need lots of babysitting. But during the boom years, it seems the babysitter asked the children how they would like to be babysat. The result? Lending by banks to Irish residents rose 450% in the decade to 2008, compared to a 30% increase in Germany and an increase of 100% in the Netherlands. The Guarantee: Heading into 2008, Ireland faced four problems: runaway public spending, a screwy tax system, and a housing market and a financial system that were effectively out of control. In late 2008, the global financial crisis started. It was then Government policy made its fifth mistake: the blanket guarantee of all bank liabilities. This effectively nationalised all banks overnight and made markets think there was no more risk holding Irish bank bonds than holding Irish national debt. However, all that unsustainable lending by banks means that holding Irish bank bonds should be a lot riskier than holding Irish debt. Some of the mistakes that were made have somewhat international roots. I don’t subscribe for a minute to the “It was all fine until Lehman collapsed” story. But internationally, the “Great Moderation” – the period of very smooth economic growth in the 1990s and 2000s – tricked lots of countries into thinking they didn’t really need to regulate their banks. However, much of the blame lies at home. With the banks, the lack of regulation here was worse than elsewhere, if the scale of bank lending is anything to go by. On building, no other country had the boom in new homes we did. And Ireland’s system of social partnership meant that Ireland’s entire public finances were run by two Departments, Finance and An Taoiseach, and the trade unions. Running a €50bn organisation with such an incredibly centralised power systems greatly increases the chance of the everything going screwy. The €85bn package from the IMF/EU shows the scale of the problem. That’s slightly more than half the size of the Irish economy – so certainly very large, but not beyond imagination. €10bn is for bank capital, with a further €25bn as an emergency fund for the banks. Adding the €30bn or so put into banks already, the total bill for the banks looks like being about €60bn. The bank bailout is a huge amount of money. But it is only about half the size of the government’s deficit between 2008 and 2015. This is a very important point: public spending cuts and tax increases are essentially nothing to do with the banks. We need spending cuts and tax increases to correct the problems we have made since the 1990s. We could shave bondholders until they’re bald but that wouldn’t change the need for €15bn in savings over the next five years. The graph below tried to put everything into perspective. The largest figures – at the top and in green – are to give some idea of scale: the size of the Irish economy and the total value of mortgage and business lending. The next four, in orange, are the warning signs: mortgages in arrears (relatively small at the moment), land in NAMA and government spending compared to receipts. The last three are additions to national debt: the total bank bailout, the deficit so far, and the deficit to 2015. 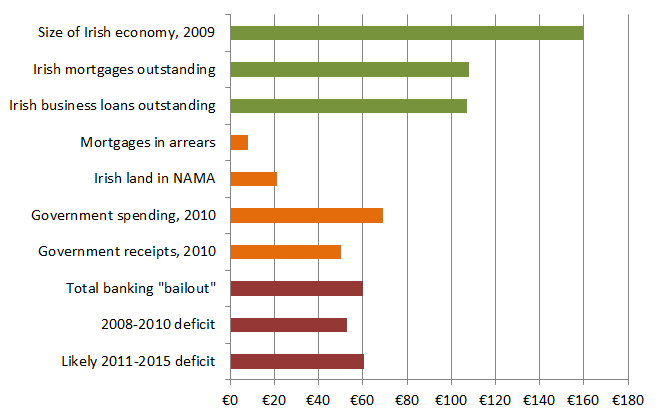 So, as voters, when thinking about Ireland’s mess, we should be very angry about the banks, but we should be about twice as angry about how the Government managed its spending and taxation. Unfortunately, this means being in favour of spending cuts and tax increases. 2010s-Ireland will have to pay for the excesses that all of us who were around in 2000s-Ireland enjoyed. Reducing and decentralising public sector expenditure: as a first step, whatever Government is in place will need to reduce public sector spending by about €10bn over the coming five years. About €2bn each will have to come from social welfare, public sector pay, investment in infrastructure and almost €4bn will have to come from healthcare, where the odd situation exists that Ireland, by far the EU15’s youngest country spends significantly more per capita on healthcare than any of its peers. A long-term strategy, though, must tackle the reason public spending was able to get so out of control in the first place: public sector organisations got money from an indeterminate central pot and therefore did not have to manage their budgets. Giving public sector organisations responsibility for managing their finances, and their people, must be the solution to sustainable long-term public spending. Sorting out the tax system: over the next five years, the government’s revenues will have to rise from €50bn to about €56bn. While this sounds complicated, in reality it only really needs three things: (1) reducing tax credits back into line with countries like France and Germany, (2) introducing a property tax, and (3) ensuring fairness by bringing in a flat income tax of 33% on earnings over €250,000, not unlike the Swiss scheme. For example, on income taxes, if tax credits had increased with inflation since 1997, they would currently allow us to earn about €6,500 tax-free, similar to France and Germany. Instead, we can earn almost three times that, without paying any income tax. On property taxes, Ireland is an anomaly among developed countries for not having an annual property tax. We know the consequences of this to our cost. Managing important markets: the other two failings of the boom years – not managing the building and banking sectors – must also be addressed. Excessive lending and excessive building are not concerns at the moment, for very different reasons, but the next Government will be putting in place the systems on which our future banking and building sectors will be built. Regulation needs to be effective without being burdensome. It’s a tightrope but we can learn from other countries. Don’t listen to those who try to tell you simple ideological solutions. One you often hear is that what has happened is the result of “blind right-wing ideology”: simply put, no “right-winger” worth their salt would ever have let government spending go so wildly out of control. Instead, fifteen years too late, we need to adapt to life in the eurozone, manage our most important markets and make sure this never happens again. Surely getting of the hole also involves growth. Staying out of the hole and making sure what we do not get into another hole for similar mismanagement needs major reform in how we govern ourselves. We now need to design and implement checks and balances that limit the scope for excess by the powerful – public and private, elected and appointed – so that our way of governing ourselves is both competent and moderate. Thanks for that – today is a focus on the structures and strategies of the government but the broader economic picture is of course incredibly important. Ireland’s international competitiveness looks solid (as per recent posts) but that will only slowly translate into jobs. Jobs-intensive growth will require imagination, such as education as an export – which for example Fine Gael have a detailed strategy on, and a strategy for “converting” unemployed construction workers into engineers. it’s great to see figures and facts as opposed to the infinite opinions. I find it amazing, with all their resources, that none of the political parties have this kind of sober, analytical, voter-friendly information on their websites – just finger pointing and rhetoric. great article, explained very well. 1. I’ve seen higher estimates of the total bill for banking. How certain are you of the €60bn figure? 2. Where does the National Pension Reserve come into these equations? 3. I understand the benefits of the currency union, but wouldn’t Ireland have been better off adopting Sterling seeing as our economic cycle and trading patterns link us more to the UK economy? you forgot to analyse the effect our Diaspora (especially in South America) could have in dragging us out of this recession. Hmm, while I suspect Diego may not be entirely serious, setting up a proper two-way relationship with our Diaspora is certainly one of the things that government can do as part of an economic strategy. Skilled migrants, greater tourism and more students are three things I can think of straight away that would help our current economic situation. Part of Swedish Freedom of Information includes the fact that all Swedes’ tax returns are published every year. I don’t think I can imagine anything more culturally shocking for the vast majority of Irish taxpayers, especially the self-employed. If you want an illustration of the chasm between Swedish attitudes to their public space and Irish attitudes, it’s this. Ireland is basically a conservative southern European country in mentality and outlook. Good luck with trying to change that culture! Everyone lived beyond their means well 99% did especially people under 50. Not many shopping trips to New York this Christmas!! Spend Spend Spend was the order of the day!! !Banks gave money for low interest but one mad a choice to avail of it. Don’t forget the people over 50 – they bought properties in Portugal and Sunny Beach and France! Thanks for the comment and reminder about personal responsibility. If we had all taken part equally in the frenzy, it would be bad enough, but spare a thought for those who deliberately opted out of, say, buying, because it was a bubble and who have to suffer. people over 50 did the best out of the Celtic Tiger: Benchmarking for PS workers; Non contributory pensions well above inflation or comparable countries and that was before selling off the gaff bought for 10,000 old pounds! People over 50 only did well if they got out in time. My mother’s retired and knows very many contemporaries sitting on enormous losses on ‘Big 2’ bank shares and BTL properties. As a member of the (I believe significantly more than)1% and over 50, this analysis is confirming not surprising. I recall a comment from a visitor back to Ireland after many years, she commented on her horror at seeing the ‘Hollywoodisation of Ireland’. It was not a compliment – the ‘mine’s bigger than yours houses’, the designer labels, the ‘beautiful Irish colleens who have all turned orange’! Says it all really, supported by Bankers and Government blather, all built on shifting sands with no care for budget control or the future. We should default and let those who are really responsible take the hit not every hardworking person in this country, who have already had to bail out a bankrupt Bank system and put up with a bankrupt (morally and in ideas) Irish Government. We owe this to ourselves and our young people. 800+ quangos, cost taxpayer some €13 billion per annum according to an aritcile in the Indo. If this is true, (I didn’t do any due dilligence on it), then why not start there? Surely we could find €6B there and not impede growth (as much , if at all) as other methods. Then slowly bring in the proposed tax systems that are needed. Our expenditure is bloated and the fat needs to be trimmed. @ Kevin, because those 800+ quangos include the health system and the education system. Sure there’s a lot of fat, but you can’t just say let’s close the HSE – this would only save a lot of money if you closed the hospitals. We can certain reincorporate a lot of core functions back into the main organisations, and save some money, but it’s unlikely to be a huge money saver in the grand scheme of things. Short version: I’m in favour, but I doubt it’ll raise more than €1bn in efficiency savings. Well 1Billion is 6% of what we need over 4 years. A good palce to start rather than increasing indirect taxes, income tax, levies, charges. I am not agaisnt raising taxes if we get soemthing back in return. E.g. College fees – I believe ~80% of university costs go on salaries. What Ireland needs now is an interim dictatorship and remove the inertia from our system. The Gov needs to look at the social welfare and address all those issues that flow from that. People are taking the piss, getting letters from employees to say they can only work 20 hours and get US the tax payer to fund their part time life style. In addition, unmarried mothers should not be getting an apt for one kid and a house for antoher, when the boyfriend is living with them, and if not, they should not be entitled to that at all! We are an educated scoiety thanks to our Gov funding on education, there is no exuse for getting pregnant and certainly no incentive for people to get married (thereby destroying the family unit protected by our constitution!) it is a Joke. All these areas need to be addressed. Its not just the goverments fault but the irish citizen too, those who have been taken the piss out of this country and the equity they show to its people. They have ruined it for the rest of us, now we must look at these areas and start testing them. People should call in and report anyone that is ripping the piss as its YOUR money they are stealing! Can we really trust existing politicians, a bunch of solicitors, to set forth policies to get us out of this mess? Hi, I have a question. It seems from the graphs above that the total sovereign debt will exceed 170BLN in 2015, is this correct? If so even at 4% average interest we’ll have to run a €7BLN or 12-14% surplus pretty much every year just to service the debt. I hope there is something I’m missing here as this doesn’t seem feasible. I make the sovereign debt to be about €123bn, on top of which you have to add future banking capitalisations, so it seems you’re talking in the range of €150bn to €170bn, i.e. about the size of the overall economy. A ratio of 100% debt-to-GDP is do-able, though tough. The surplus you are talking about is the non-debt balance, which is not a widely used measured. For example, it may surprise you to know that the non-debt balance next year will be only about €5bn and will more than likely be a surplus by 2013. The headlines will focus on the full deficit (and ultimately rightly so), which includes debt servicing. One other thing to note is that almost all countries only ever service their debt. Very few ever get around to paying back the principal. “What Ireland needs now is an interim dictatorship ..”. Aye, Fergal said above that Ireland is basically a Southern European country in mentality. Interesting article, been living with my head in the sand for a few years so I’m only getting round to figuring out what’s going on now and I’m sure your site will be useful. could you clarify what you mean by fairness here? Is this an extra band above the current top tax band? Thanks for the comment. This would be a flat income tax of 33% on *all* earnings by people whose income is greater than €250,000. Currently (or rather as of 2006, the last figures we have), they pay on average 27% but some will pay far less and some more. This would eliminate the incentive for legal tax avoidance. The all-in average rate for people earning below €250,000 never goes above 30%. I like the article Ronan. My question is, I know you can only deal with figures you have now but do you reckon where we are is the bottom? Can it get worse and how much worse can the economy withstand? Thanks for the wonderful article! Very clear and with some interesting and unique points. It’s evident you know your stuff. Ronan, you sum up the route to disaster very precisely. Perhaps the gravest mistake was simply not reigning in the economy while it was clearly overheating (’98-’08). Quite the reverse, the governments were happy to stoke the fires, e.g. outlandish tax incentives to build even more unneeded home. 2) Large increases in taxation are required to tame the debt. 3) We need growth to pay our way. The problem is that 1 and 2 above are incompatible with 3 – increasing tax and cutting spending CANNOT lead to higher growth. If we squeeze the consumer with higher tax and lower incomes, where will this growth come from?